I just came back from Derawan islands, East Kalimantan (some of you might be more familiar with the old name, Borneo, rather than Kalimantan). I was so excited about the trip, because it was the very first time I stepped foot on Kalimantan, one of the big five main islands of Indonesia. I spent 5 days 4 nights in Kalimantan, staying 1 night at Tarakan and 3 nights on the Derawan islands. Derawan islands consists of Derawan, Sangalaki, Kakaban, Maratua, Panjang, and Samama Island and some other tiny islands. There are two ways to reach Derawan. The option that I took was via Tarakan (there are some direct flights from Jakarta to Tarakan). I personally think that this route is more comfortable if you come to Derawan in a big group. From Tarakan’s airport to Tengkayu harbour took around 20 mins by car. The boat from Tengkayu harbour to Derawan islands took around three hours by speedboat. The other option is via Berau. This is a convenient option for solo traveller or people who travel in small groups. The minus point, there are no direct flights from Jakarta to Berau; you need to fly to Balikpapan first and then you can continue to Berau. When you arrived in Berau, you can take a car, (2,5 hours trip) which costs you Rp. 70,000/person, to Tanjung Batu. 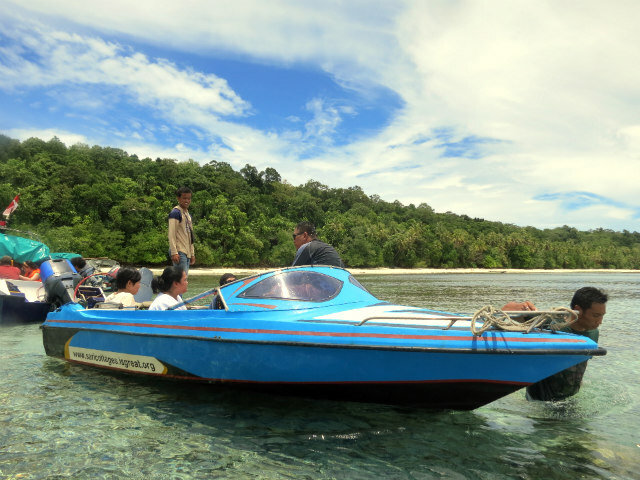 From Tanjung Batu to Derawan by boat costs you around Rp. 50,000/person and the journey takes 30 mins. Please always ask the driver / locket counter for the ticket price before you get into any vehicle. What makes the Derawan islands different compared to the 17,000-ish Indonesia’s islands? 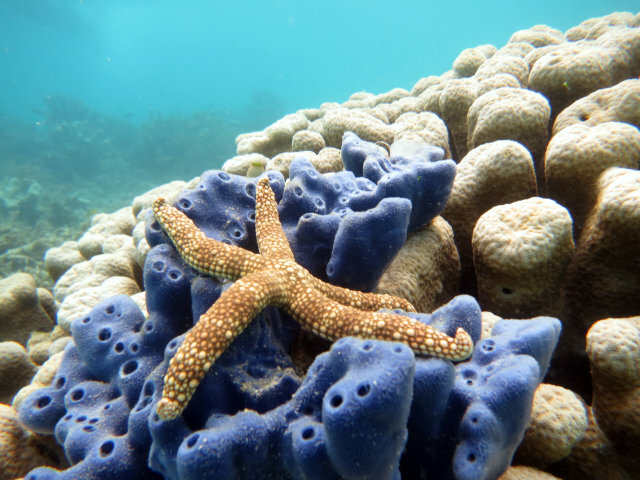 Check out several reasons why derawan islands are worth exploring. Although one of my best friends did say that Derawan islands were not that good, I really enjoyed my trip and recommend you visit these islands. Nothing beats diving with dozens of manta rays. 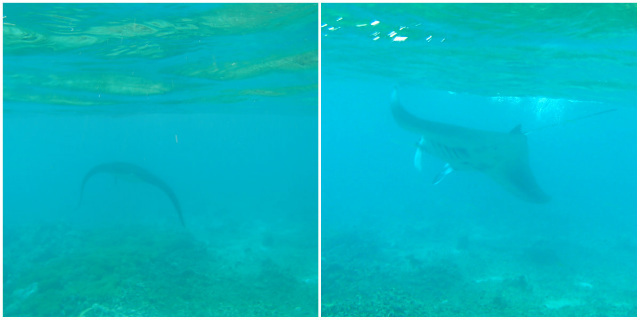 So when I knew that we would get a chance to swimming with Mantas around Sangalaki island, I was really excited. It was difficult swimming with the Mantas in derawan. I needed to swim in the rough sea and the mantas were as random as can be, can and appeared ANYWHERE. So I had to count on the boat crew who always pointed “There!” “Hurry up, swim straight around 15 metres!”. I finally swim with one manta and I was just happy as that. Oh, you can also swim with Manta Rays in Raja Ampat. So many turtles around Derawan. 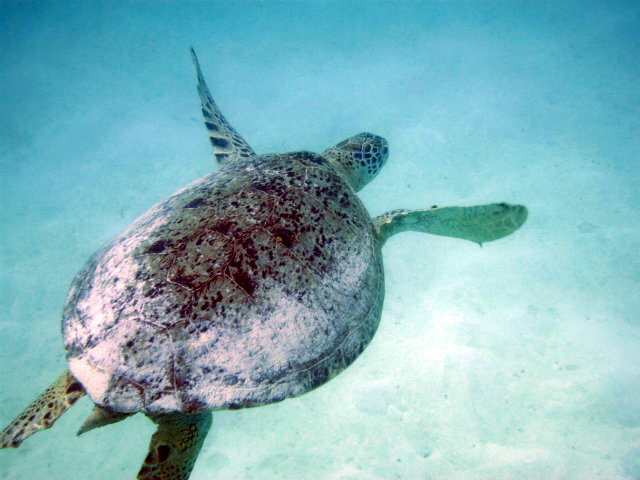 When snorkeling or diving, seeing a turtle is almost as casual as as meeting fish. Some of the turtles even hung around our cottage. So if you really love turtles and dream of swimming with them, then this destination is your biggest chance. You can also meet with Mr. Turtle when diving in Gili Trawangan, Manado, and many more places, but you will usually see only one or two turtles if you are lucky! I always freak out whenever I discover there are jellyfish in the ocean. I almost drowned in Lampung years ago when one of my legs was stung by a jellyfish. When I arrived in Lake Kakaban and realized that the lake was full of jellyfish (though I read that these ones are stingless), I did freak out a bit. I took time to analyze from the pier. Ah, I convinced myself that these jellyfish look different and cute. After several minutes, I swam around the lake and got addicted to the cuteness of the stingless jellyfish. Remember not to wear your flippers when you snorkel in this lake, it seriously will straight away kill the jellyfish when you accidentality kick them with your flippers. I love banana. You can find fried banana (or any kind of banana related food/drink) as a snack almost anywhere in Indonesia. 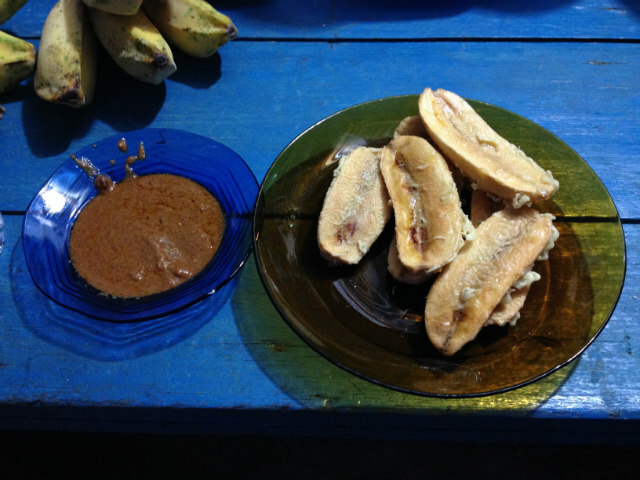 When I first saw it, I was not too sure about the fried banana served with peanut sauce in Derawan. I thought it was going to taste weird and I was a bit anxious. I tried it though and yes I was wrong! The fried banana with peanut sauce was so tasty! I want more! We were so lucky that the weather improved on the second day in Derawan. The sky was so blue, the sun was bright and lovely. All this made Gosong Senggalau, the broad white sand in the middle of the sea, super pretty. I love the clear water, the white sands and the super fluffy clouds. Right, local people can be found anywhere. Start a conversation, listen to their life stories, the different accents, joke and laugh with them or buy food and souvenirs from them. Interactions with locals, whatever these interactions happen to be, will certainly be very special. Have you ever been to Derawan? What is your favourite thing about the islands? It was great discovery called The Magic of Derawan. Your blog make me enjoy to delight the happiness in togetherness during the Derawan trip. My graetful to you and warm regards to Nico ya. I love Sangalaki island too! Helllo.. its really nice to jump into this blog. very informative 🙂 May I know where did you stay in Derawan? did you rent a speedboat to do hopping islands? if yes, do u mind to share their contact number? Thanks for dropping by 🙂 I stayed at Mirroliz Pelangi. You can contact Mrs. Lilis at +628125863696 or +622552 21627. 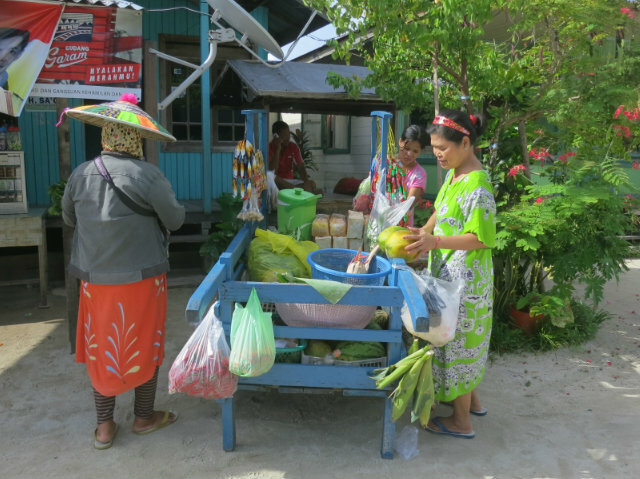 The homestay can arrange the speedboat as well or walk around the island and try to join a group of people in Derawan for the islands hopping. Oww, oke. So, this is why my gf really want to go there. 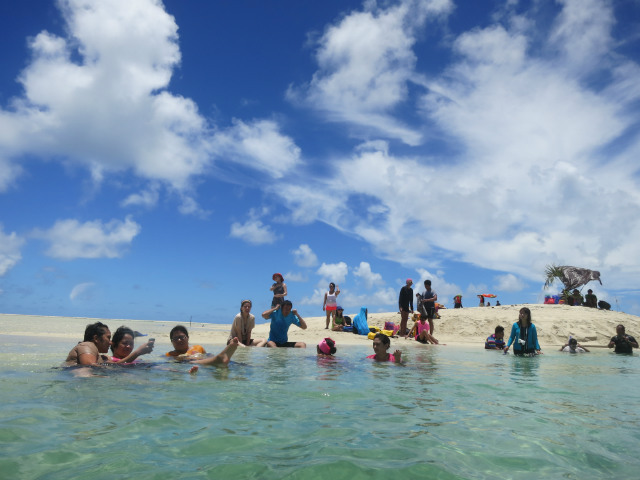 Swim with stingless jellyfish and turtles. But we dont have dive license, is it okay just snorkling there? Hi Irfan, You do not need to have a dive license to snorkel. I hope you can visit Derawan with your girlfriend soon. I hope you can visit Derawan and greet the stingless jellyfish soon! Thanks for visiting my blog. Ya Ampuuunnn….menemukan my buddy in crime di sini!!! Kapan kita diving bareng yang entah kapan terlaksana itu. Udah sekota ini, tetep aja susah ketemuannya yah. Anyway…ttg Derawan…Waktu itu, kamu diving dengan DC sapa di sana? Kapan dong kapan kapan kapan.. Wacana terus. Hehehe..
Nice blog, Firsta! Concise and informative. The layout and pictures are nice too. There seems to be flights now from CGK ( Jakarta) to BEJ (Kalimarau Airport) according to Kayak (https://www.kayak.com/direct/CGK-BEJ/2016-01). The flights are operated by KalStar (http://awan.sqiva.co.id/app-ibe-kalstar-search_flight?___r=e44d90f0b9375d530cba628440fc34922a4af53b), but I can’t seem to buy a ticket online. Do you have any advice on how to get these tickets? Hi Arash, sorry can’t help. I’ve never flown with Kalstar. Check this one out: http://bandarasoekarnohatta.com/jadwal-penerbangan-rute-jakarta-jkt-berau-bej.info. All the best!